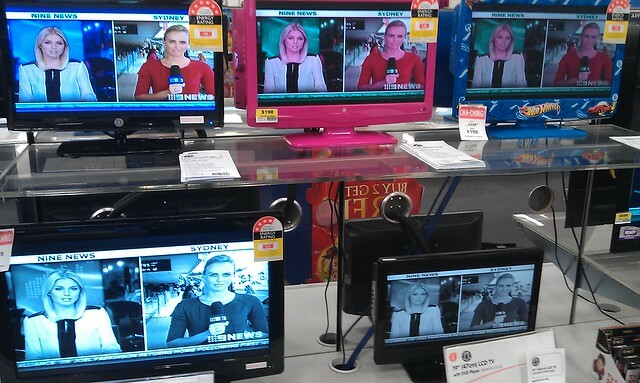 Is Big W deliberately trying to discourage people buying TVs from them? 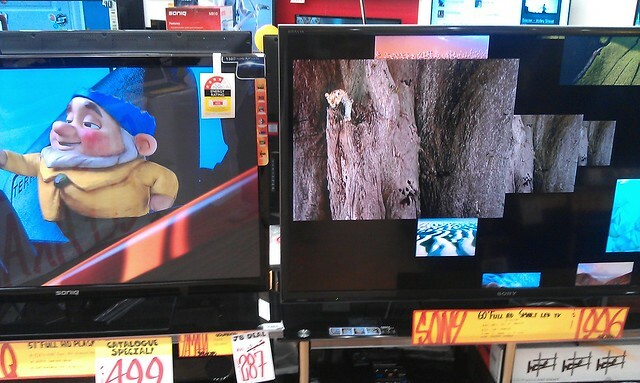 The key difference seems to be that the JB Hifi people know how to set up their TVs. The Big W people don’t know, or don’t care, that on almost all of the TVs they have on display, the colour is completely distorted. If you can’t see a display product working properly, why would you buy it there? ← Previous Previous post: Flyer highlights public transport – are Coalition MPs starting to get worried? You can’t see it working properly in JB either, because all their TVs (save a handful playing BluRay discs) are playing a RGB signal, not HDMI-digital nor DVB-T digital. Years ago I asked about the setup of the TVs in JB and the sales guy said that sure, they all look different – we take them out of the box and plug them in; no tuning or fiddling to get the picture looking good, this is how they come from the factory. So, all you can rely on for a side-by-side comparison is Choice magazine; your library probably subscribes – mine does, and allows me electronic access to all their reports. They do sell a higher class of TV set in JB HiFi. The only decent telly I saw in Big W recently was the Sony Bravia one demonstrating the video games. It wasn’t for sale! It’s not at all relevant, but about four years ago I bought the very last CRT TV for sale at Big W in Sydney. It was only $79 because they wanted to get rid of it. Unfortunately it only lasted two years. People are already throwing out working flat screen TVs to get a bigger model, what!